The graduates of Ivy League schools have been responsible for some of the greatest cons in American history (the Vietnam War, for example). But because Cornell is Cornell, this was the best they could come up with. 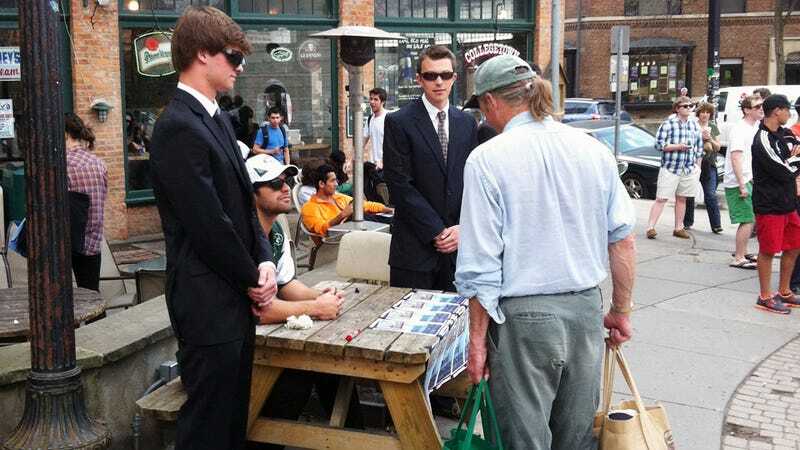 For "Hell Week"—the week during which fraternity and sorority pledges are subjected to the most visible of their many humiliations—Sigma Chi* made a freshman recruit dress himself as Mark Sanchez and sign autographs for the public downtown today. (If you've ever been to Ithaca, you'll know that I use "downtown" quite loosely—it's a few appropriately tweedy coffee shops, a Wegmans, and 14 or so stray cows milling about.) As you can see, he's flanked by some aspiring-frat-boy-lookin' types dressed as Secret Service agents, because when Mark Sanchez needs protection from Finger Lakes folks, Mark Sanchez enlists these dudes. *Update: Sigma Chi has written in to say these aren't their pledges. If you know more, drop us a line. Writes Deadspin reader Alexandra, "By the looks of things, a lot of people believe it's really him (what can I say, it's Cornell...we're not a sports school)." At least she got a phony autograph (albeit one that looks nothing like the genuine article) out of it. 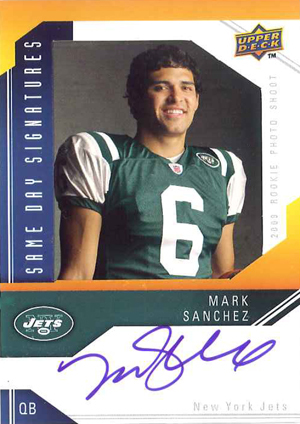 Fake Sanchez's message: "Keep dreaming." OK, Cornell frat bros. Nice wordplay.